In electronics, resistor (and sometimes other components) values are shown by a sequence of colours. Now there are lots of methods of trying to remember the number/colour sequence - but most beginners seem to find the colours difficult to remember. In truth most skilled engineers don't go through the steps of working out the colours any more than you would work out c-a-t when looking at 'cat': you simply see the word as a whole. In the same way an experienced engineer simply recognises yellow-violet-red as being 4K7: we don't (need to) spell it out. In fact if I get a strange colour code I don't immediately recognise as a 'word' then I have problems and have to start thinking about the value. In exactly the same way as there are common words in English, so there are common values in electronics. The commonest 'value set' is called the 'E12' set - because there are 12 values in a decade. See below. 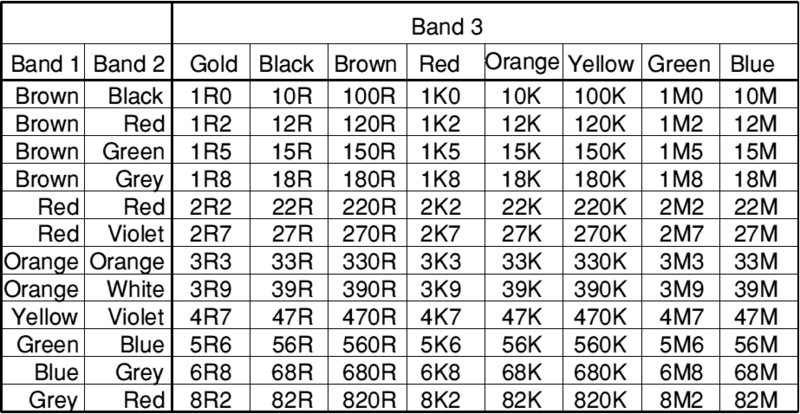 So the following chart shows the standard 3-band method for the commonest E12 values. It is a GIF, to help you print it out separately if you wish. To use it, take a common (E12 series) resistor: this will have a gold (possibly a silver) band at the end with 3 other bands. Ignore the gold band - hold the resistor with this on the right, and start reading from the left end so you read towards the gold band. The first two bands should be one of the combinations shown in column one of the chart. This shows the 'decade value' of the resistor. The third band is the multiplier - it tells you which decade range the resistor is in. 4QD have used this chart for beginners for years now and it is far easier than trying to teach the colour code. So why put the K in the middle? Why not say 3.3K?. This comes down to the days of bad photocopiers. Take a circuit diagram and photocopy it. Then copy the copy. Soon you end up with a dirty copy with stray dots all over it. Is that a 33K or a 3K3? This doesn't happen with it written as 3K3. And after all you say 'three thousand, 3 hundred' so is K is a thousand, 3K3 is totally logical. Same system is usually used for capacitors also. Also, you may have noticed that some of my circuits are a little tight. I used to work for a company that made welding machinery and, before I arrived, the circuits were all drawn by the draftsmen on A1 (33 x 23 inch) paper. Imagine fighting such a drawing when you are trying to trace a wiring fault whilst balanced precariously on the top of a machine some 20 feet in the air. What do you drop, the meter or the circuit diagram? Besides - I'm too mean to buy a large printer! Dense drawings mean small paper and 3.3K is longer than 3K3. Some capacitors use the same method of showing the value by colour code. Unfortunately many capacitors also show things like temperature coefficient, so they can be more difficult to read! But a lot of capacitors simply show numbers such as 102: if you pretend these numbers are colours you get brown-black-red, which translated to 1000 - this is a 1000pF or 1n0 capacitor. These numbered capacitors invariably 'count' the value in pF (picoFarad). Used for small value capacitors for RF work. General purpose, so many different technologies with widely differing temperature coefficients. Medium value, say from around 10n to around 1µ. Larger values are available and are used where the polar characteristics of electrolytics are undesirable. Chemical capacitors where the dielectric is formed chemically by a very thin layer of oxide on an aluminium or tantalum metal film. Because of the chemical action, they are polarised and have to be used with the correct polarity. Because of the thinness of the dielectric, they can squeeze very high capacitance values into smal packages. The minimum size of a capacitor is generally proportional to the working voltage multiplied by the capacitance. There are several 'preferred value' series: the commonest is the E12 series because it uses 12 possible values (1 - 1.2 - 1.5 - 1.8 - 2.2 - 2.7 - 3.3 - 3.9 - 4.7 - 5.6 - 6.8 - 8.2) per decade. This is the series in the chart above. As a designer who also runs stock control, purchasing and accounting I have a distinct preference for an 'E1' series: One value per decade, i.e. 10R, 100R, 1K, 10K, 100K etc. Realistically this is not enough so I tend to use the E6 series (1 - 1.5 - 2.2 - 3.3 - 4.7 - 6.8) or, better still the E3 series (1 - 2.2 - 4.7). It is surprising how many circuits can work properly with only E6 values! There exist also E24, E48 and E96 series. E24 is relatively common but I hardly ever use it: is it the E12 values plus 1.1 - 1.3 - 1.6 - 2.2 - 2.5 - 3.0 - 3.6 - 3.9 - 4.3 - 5.1 - 6.2 - 7.5 - 9.1. In fact, so seldom do I have to use this set, that is is a conscious act of recall to remember it! E48 and E96 I think I have never (in 30 years of electronics) had to use more that for one product - and that was a digital multimeter which needed some very accurate resistors for its calibration network! In electronics, particularly at the beginner's level, we start with certain postulates such as 'take a single transistor, and bias it from a 12v supply with 1mA collector current so that its collector sits at half the supply voltage'. Now for any practical purpose it's not going to matter whether the supply is 11, 12 or 13v and the current anything from ½ to 1½mA. The half rail may also be ± a volt. So instead of ending up with, for instance, 6.1K we could start with 4K7 and work from that. It all depends how well you understand what you're doing! But, as a manufacturer, every time I introduce another item on to a parts list, that's another part for stores to count out, for production to insert, for inspection to inspect and for the testers to check. There is a price to be paid for every extra part on the parts list for the product. That price is much higher if it's a part we don't already use - then minimum and maximum stocks must be determined, stock counted and re-ordered, orders checked as they are received and bills counter checked to be paid. The problem's less with a standard thing like a resistor than with a capacitor, so if I have a critical circuit (usually because it's 'tuned' to a particular frequency) I prefer to use a standard capacitor and a less common resistor value! The other thing that confuses beginners to electronics is all this business about K, m, n, µ, p etc. Most people seem to be OK with resistors, but capacitors also cause consternation. I guess we in 'the rest of the world' have a bit of advantage because we have decimalised,, so we tend to ge used to Kilogrammes, millimetres, centilitres and similar. It should come as no surprise that this prefix (Kilo, milli, centi) is the same prefix that we use in electronics but we electronics engineers are a bit more rational than most so we have rationalised it: the prefixes we use are only the 1000 multipliers/dividers. So you won't find use using deci or centi as a prefix, they are 'only' 10 and 100 divisors. Nothing short of 1000 is good enough for us! The list shows the commonest prefixes. Note that the multipliers all have capital single letters, the divisors all have lower cases. Each prefix is 1000 times larger than the one below it, or 1000 times smaller than the one above. So a 1nF capacitor is 1,000pF or .001µF. And, to be consistent one would therefore call a 1,000µ capacitor 1 millifarad, or 1mF. Although this would be technically correct there is a long history of mechanical typewriters not possessing the Greek µ sign so people have variously improvised, using uF or mF indiscriminately instead of µF. So mF is sort of 'previously spoken for' and is never used thus.